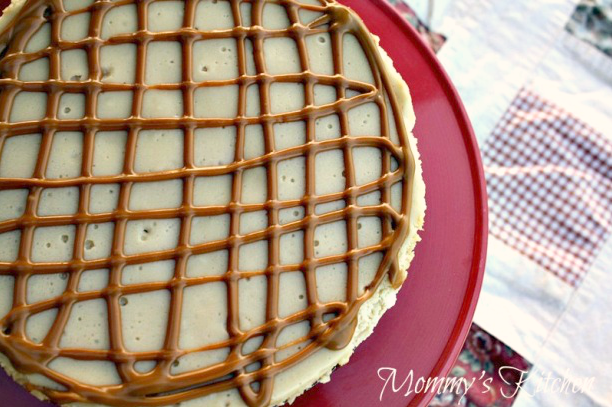 If you love Biscoff you're going to love this Creamy Biscoff Cookie Cheesecake! An easy 8 ingredient crock pot 😉 cheesecake with all the yummy flavors of Biscoff Cookies and spread. Last Friday I promised that I would post another yummy Biscoff recipe. Well, our beautiful Texas weather got the best of me, so I didn't get a chance to post it. No worries though because today's the day!! Last week when I baking those yummy Biscoff Donuts I kept thinking about what other recipes I could come up with using that delicious spread. 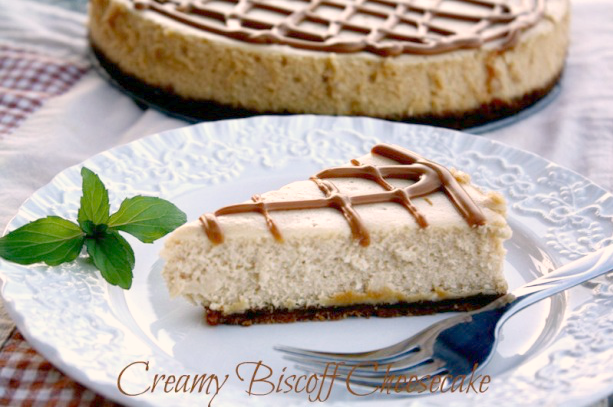 Cheesecake immediately came to mind, so the next day Creamy Biscoff Cookie Cheesecake was on the menu. The Biscoff Cookies are really sweet, so I was undecided on which type of crust to go with. Should I use crushed Biscoff cookies or a graham cracker crust? I wasn't sure if using a biscoff cookie crust as well as adding the spread to the cheesecake would be too much. I took a chance and went with the cookie crust anyways. The verdict.................. I'm so glad I did because it wasn't too sweet at all. In fact it was perfect. Between my family and our neighbors we polished off the cheesecake in less than 24 hours. Next time I want to use the crunchy Biscoff spread and see how that works out. If you have Biscoff Spread in your pantry I highly recommend making this cheesecake because you won't be sorry. Of course I'm still over the moon about baking a cheesecake in my crock pot, so that's the method I used. 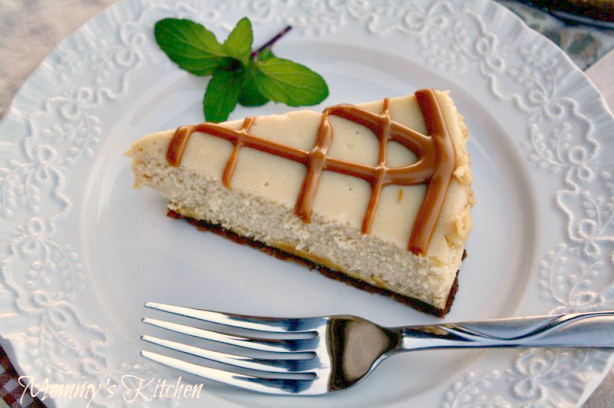 Click here for a full step by step photo tutorial of the crock pot cheesecake cooking method. Lets start by making the cookie crust. Using a food processor crush the biscoff cookies and mix with melted butter. Blend with a fork until just combined and press into a 7 - 8 inch spring form pan, or something similar. (a 7 - 8 inch cake pan will work whatever will fit in your crock pot). Using a hand mixer or kitchen aid add the softened cream cheese to a large bowl and mix with 3/4 cup of granulated sugar. Add the 1/2 cup Biscoff spread, eggs, one a time, then vanilla, mix until thoroughly blended. Continue to beat for three more minutes, creating a smooth lump free mixture. Pour the cream cheese mixture into the prepared pan, set aside. Pour 2 - 3 cups of water into your slow cooker. You want enough water to steam your cheesecake for a few hours and not run out, but not too much water that it gets into your pan. Cover and cook on high for 3 hours or until a knife inserted in the middle comes out fairly clean, and the cheesecake does not jiggle. Do not remove the lid during the cooking process, it needs all that heat! When finished, run a knife along the edge of the cheesecake. Remove the cheesecake from the crock pot and let it cool on a baking rack for 30 minutes. Transport the cheesecake to the refrigerator and store for at least 6 hours or overnight. Drizzle additional melted Biscoff spread on top of cheesecake about 1 hour before cutting. Start by making the cookie crust. Using a food processor crush the Biscoff cookies and mix with the melted butter. Blend with a fork until just combined and press into a 7 - 8 inch spring form pan, or something similar. (a 7 - 8 inch cake pan will work really whatever will fit in your crock pot). Using a hand mixer or kitchen aid add the softened cream cheese to a large bowl and mix with 3/4 cup of granulated sugar. Slowly add 1/2 cup of biscoff spread, eggs, one a time, then vanilla, mixing until thoroughly blended. Continue to beat for three more minutes, creating a smooth lump free mixture. Pour the cream cheese mixture into the prepared spring form pan, set aside. Pour 2-3 cups of water into your slow cooker. You want enough water to steam your cheesecake for a few hours and not run out, but not so much water that it gets into your pan. Add 3 tablespoons biscoff spread to a zip lock bag. Melt on the defrost setting of your microwave for 30 seconds. Using scissors cut off a tiny spot on the end of the bag and drizzle all over the cheesecake about a hour before serving. Note: A graham cracker crust can be used in place of the Biscoff Cookie crust. To make a graham cracker crust: Crush 8 graham cracker rectangles and mix with 1/4 cup melted butter. Press into spring form or cake pan. Click here for full step by step photos and directions for the crock pot cheesecake cooking method. What a unique way to bake cheesecake. I'm going to have to try this! By the way, I have been meaning to develop a recipe for Biscoff Cheesecake but looks like you beat me to it. Looks great! Does it matter the size of crock pot used? For this method? What ever crock pot you have that a spring form or small cake pan will fit in. Walmart has the small 7 inch cake pans in the cake decorating isle. A regular 9 inch cake pan wont work. I used my 8 inch spring form pan. I tried your crock pot/steaming method for oatmeal a while back and it was genius! This cheesecake method looks fabulous. Just curious- is there anything cooking it in a crock pot does that you wouldn't get from baking the cheesecake? When you cook it in the crock pot the cheesecake is cooked by steam. This prevents the cheesecake from cracking in the middle. It is similar to using the water bath method in the oven for cheesecakes. Except in the crock pot the cheesecake isn't placed directly into the water bath, but above it instead. I like the crock pot method because I can fix it and forget it!! It doesn't get too brown on top either. I just add it to the crock pot and 3 hours later it's done. Yes its a bit more time than traditional oven baked cheesecake, but I don't have to sit and watch it.